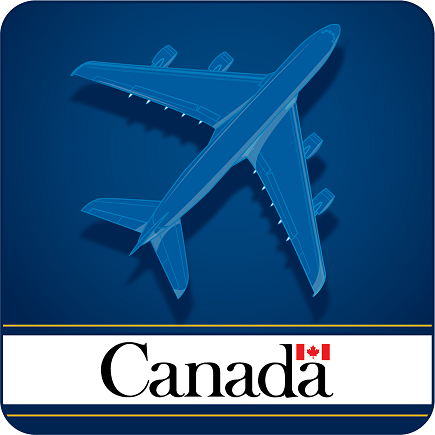 The eDeclaration mobile app helps to save time at the border upon arrival in Canada. Reduces your processing time at a Primary Inspection Kiosk by up to 50% upon arrival. Most travellers, including returning residents and foreign nationals, arriving at a Canadian airport with Primary Inspection Kiosks. Who cannot use the app? Travellers with a non-machine readable travel document. Can NEXUS members use the app? NEXUS kiosks do not work with the mobile app. NEXUS members can use the app as a regular traveller, in conjunction with a Primary Inspection Kiosk. A traveller’s hand is holding a mobile device in front of a Primary Inspection Kiosk. The CanBorder eDeclaration mobile app’s main screen is on the mobile device with three option buttons: My Declaration, QR Code, and Travellers. The traveller selects the QR Code option and a QR Code appears on the mobile device’s screen. The traveller lowers the mobile device and holds it under the QR Code scanner with the QR Code facing up to scan. The scanner’s red light turns off, the traveller removes the mobile device and the kiosk’s screen then shows an airplane flying around the globe. The kiosk sessions proceeds with the next step on the kiosk screen. The traveller lowers the mobile device and places it on the QR Code scanner with the QR Code facing down to scan. The scanner flashes a white light twice, and text on the kiosk’s screen asks the traveller to please wait. When the scan is complete, the traveller picks up the mobile device from the scanner and the kiosk sessions proceeds with the next step on the kiosk screen. A traveller’s hand is holding a mobile device in front of a Primary Inspection Kiosk. A QR Code is on the mobile device’s screen. The screen zooms out and the words “Upon arriving at the kiosk, scan your QR Code before selecting your language” appear at the bottom of the screen. The words disappear. The traveller turns the mobile device around so that it faces down and lowers the mobile device towards the QR Code scanner on the kiosk. The screen zooms in on the traveller holding the mobile device face down on the QR Code scanner. The traveller removes the mobile device from the QR Code scanner and the words “Continue to follow directions on the screen” appear at the bottom of the screen. eDeclaration can only be used at airports where Primary Inspection Kiosks are available. As new airports are added we'll update the app. Your feedback on our mobile application will help us improve future releases. Send us your compliments, comments or complaints or take a few minutes to rate or review the app. Please include as much information as possible to help us better understand the nature of your feedback, such as arrival airport, mobile device you used (type of device, version, operating system), etc. Regarding difficulties in scanning the QR code, we incorporated enhancements for each airports’ kiosk. Make sure you select your correct arrival airport when preparing your declaration on the app. Is it safe to use the mobile app? The mobile application is safe and secure. It was designed to limit data collection and ensure your privacy. Within the app you are identified only by a nickname. Upon arrival, your declaration will be reconciled with your legal name when you scan your travel document at a Primary Inspection Kiosk. Once downloaded onto your mobile device, you do not need an internet connection to use the app. The eDeclaration app operates entirely in airplane mode and can be safely used during your flight to Canada. If you do not have a mobile device, you will complete an on-screen declaration at a Primary Inspection Kiosk upon arrival. How do I scan my QR Code at a Primary Inspection Kiosk? Make sure you select your correct arrival airport when preparing your declaration on the app. Do not select a language when you arrive at the kiosk. Simply scan your QR Code. If you are arriving at Ottawa, Edmonton, or Toronto Billy Bishop airports, hold your device so that the QR Code is facing up to scan. If you are arriving in Vancouver, Halifax, Montreal, Quebec City, Winnipeg, or at Terminal 3 of Toronto Pearson, hold your device so that the QR Code is facing down to scan.